The Transformers -Arrival from Cybertron Vhs Paper cover has been in blank case , not original case but it is original sleeve & tape Full length cartoon Tape has some numbers wrote on it but vgc otherwise- Dispatched with Royal Mail 2nd Class. The Iron Giant. VHS - New, still sealed with a small tear to the plastic seal. Could possibly be glued together. Tested and working. UK Video Gems edition, 1987. TRANS FORMERS THE MOVIE - VIDEO GEMS RELEASE - PAL/VHS. The Animals of Farthing Wood 1-6 8 VHS Please note some of the slip cases are a little tatty. Marvel Comics Iron Man - Origin of Iron Man (U). All these films are in a used condition, and have not been tested. The collection consists of:-. New listingThe Jewel in the Crown and Brideshead Revisited series boxset. Pal VHS Video. Two classic TV drama box sets on VHS. Also, the boxes would make nice storage cases if you do not need the tapes! The Vhs is in Very Good Condition with Original Artwork. As titled. Please see my other listings. Platform: VHS Video. Contents: Case & VHS Only. Condition: Acceptable Condition - Cover Edges Worn, Spine Wrinkly. Video tape is tested and working. All tapes are rewound ready to watch again. The unedited version is right next to it. Quite common with vhs tapes. Transformers VHS Video - Thief in the Night Surprise Party - WHSmith Exclusive. Condition is Very Good. Dispatched with Royal Mail Signed For® 2nd Class. All VHS are Original and factory produced. CULT CLASSIC VIDEO. HAS BEEN WATCHED ONCE TO CHECK QUALITY. 12 TO 15 VIDEOS FOR £6. Video good condition, cardboard box shelf worn. This is a cool item. Small box. Tested and works. Generally within 24 hours. Its condition is consistent with its use and age. I will help as much as I can. Lots of photos are included so you can see exactly what you are buying. 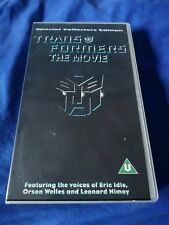 Transformers super video over 90mins - 4 stories - retro VHS collectable. Condition is Good. Dispatched with Other 48h Courier. The Jewel in the Crown and Brideshead Revisited series boxset. Pal VHS Video.